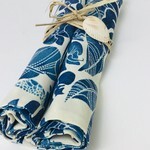 A pair of Tommy Bahama tropical placemats in outdoor fabric. Tommy Bahama outdoor turtle cushions. Beach house style.